Our last day at Future World in EPCOT was all about speed and thrills – first blasting off into space then zooming around a test track. Plenty of nervous anticipation (from me at least) – could I handle these thrills was the question. Our first Fast Pass was for Mission Space so we headed there. I had seen and read a lot (too much) about this ride, one of EPCOT’s newest experiences and I didn’t know whether to be excited or terrified. They say it is intense and as close as you get to blasting off into space without leaving earth – eek! The building is impressive with planets and bright colours outside, inside the theming continues as they take you into a futuristic International Space Training Centre. From the moment you step through the door though, you are bombarded with warnings about the intensity of this ride and alerts of claustrophobia and virtually every other phobia under the sun. It put some people off in our line and they left, I nearly did the same. There is the option to choose a less intense (green) experience or a more intense (orange) ride. Caution prevailed on our first visit and we picked the green line. We did try the orange ride on a different day, it is definitely far more extreme and not for the faint-hearted with spinning simulating G-force and weightlessness. I much preferred the tamer option which had movement but not strong spinning. We entered our space rocket and a harness came down over our head and shoulders locking us in place. The screen moves very close to your face and you tilt backwards at quite an angle. This actually was worse for me than the spinning – quite claustrophobic, extremely tight and I started to feel my stress levels rocket. I did calm down though once the ride started. Husband and Son were oblivious to my paranoia and loved it all. There are 4 seats in each vehicle, 4 video monitors and 4 sets of control switches and each passenger gets to be either the Engineer, Navigator, Pilot or Commander with some “missions” to complete and tasks to perform during the ride. The launch countdown began, the engines roared and we blasted off, an incredible feeling of increasing speed as we “left” earth. I was struck by the number of sickness bags all around the vehicle, luckily we didn’t need them – plenty of cool air blasting onto our faces throughout the ride seemed to take care of that. There is a large area beyond the ride with games, interactive space stuff and a Space-Race multi-player game which was the most fun and something we had to drag Son away from. 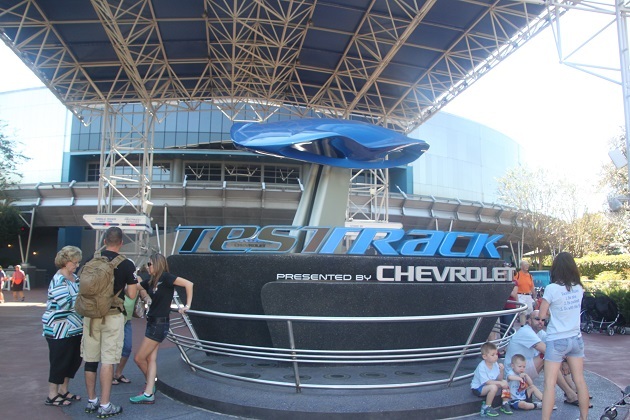 After all that astronaut excitement it was straight to Test Track – another great ride and something that is literally breath-taking. Husband and I had done this years before so I knew what to expect – always helps! Again we had Fast Passes, the line here was never anything other than super long, I was relieved Husband had been organised and our wait was not so bad. We passed through an interactive design kiosk first where we were able to design our dream car on screen. Son was in his element here with the giant touchscreen, selecting shapes, colours and other components for our dream machine. We did this ride twice and enjoyed this part just as much second time around, coming up with a completely different car. Next it was time to climb on board our 6 passenger vehicle – your own car design follows you around the ride in a virtual sense and at the end of each scene they tell you how it has performed. We passed through 4 different car testing scenarios – were flung around bumpy terrain in Capability, roared through hair-pin bends in Efficiency, sped through some icy cold chambers and then the highlight – Speed which was our favourite part. The car literally took off, we zipped around an outside track onto 50 degree banked curves and had our breath literally taken away. 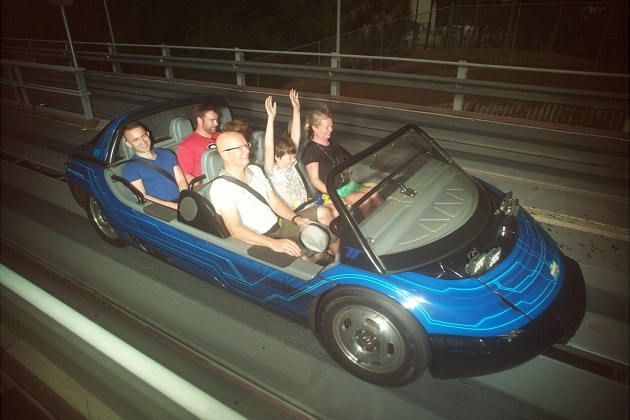 Apparently this is the fastest ride in Walt Disney World and is such a thrill – the photo taken mid way through gives no idea of the exhilaration. The post show was pretty good too – first we saw how our car design scored against others from that day (badly for us). We did improve a bit though second time around. 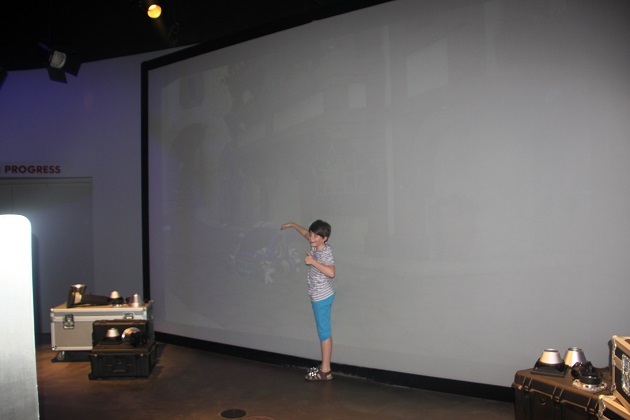 Lots of interactive and hands-on activities followed where you could tweak your car design a bit more, see it featured on a TV commercial and race it on a virtual track – all great fun. The experience finishes in a showroom full of Chevrolet cars and the chance to have pictures taken with a range of concept cars – an amazing end to a really fun and thrilling experience. I love EPCOT!!!!!! So cool! I know – these two rides were off the scale!! 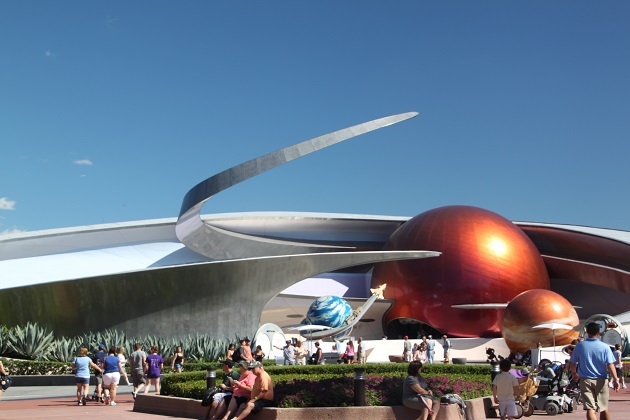 I’ve heard about Mission Space and don’t think I could do it – I’m very claustrophobic, and I think I’d get sick! Good for you for sticking it through! It was a close thing for me – nearly bottled it in the line but actually once it started it was fine… it’s that mind thing though and I think if you have bad claustrophobia best to avoid!! No you won’t George – it is incredible, a real thrill and such great fun. 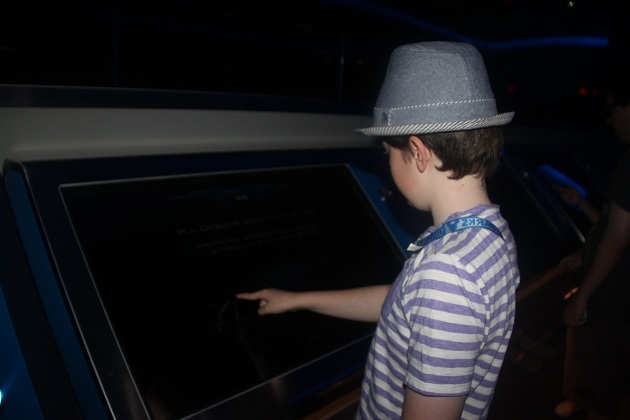 Mission Space – that’s the one for sick!!! Yeah, I could never do mission space. Did your husband attempt it? I know he gets motion sickness. He gets it really really bad – even on things aimed at little kids, standing joke in our house – it took him about a day to get over the Simpsons in Universal Studios but he did the green and orange rides on Mission Space and was fine….weird… I think it must be all in the mind for him!! Love these two rides. The grandkids, 11 and 7, both love the Orange more intense side of Mission Space, I can only do that once per day. Seems we brought them up as coaster lovers since they have been on these types of rides here and with our Annual passes at Disneyland since they made the height limits. Great story. Thanks Terry, what is it with kids!! They can hop on and off all of these extreme things with not so much as a wobbly knee…. different story for me though, must be getting old!!! Thank you Rosemary – they were definitely thrilling experiences, I nearly bottled out on both of them but am glad I didn’t!! Don’t think I’d be queuing up for a space flight though if it came up!! So you haven’t put your name down for the one way tickets to Mars?! I admire your bravery Joy – I know I wouldn’t have gone through with those rides so it’s great that you had such a memorable experience! Definitely not Rosemary!! Bad enough going up in an aeroplane for me!! Both these rides are just amazing – thrilling but still really clever too. Forget the kids, my husband would love this. Absolutely – we loved them! !